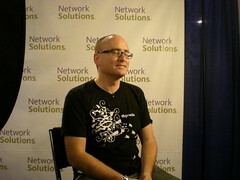 Darren Rowse Hit Me With An Elevator Pitch! This entry was posted in People and tagged Darren Rowse Elevator pitch on April 7, 2009 by Mario. Just like thousands of other bloggers I also join the 31 Days to Build a Better Blog challenge by Darren Rowse, creator of Problogger. As a participant you receive interesting additional e-mails besides his daily blog posts, during the next 31 days. Today was the first day and Darren already hit me and made me think. Not just think briefly about my blog, no, he made me think deeper than I had time for. He suggested to write an elevator pitch for my blog. That means in fact the following: if your blog would be a business idea, how would you present it in a short ride in an elevator if you wanted to present the idea to a potential investor. Telling somebody about my blog before the elevator hits the ground and then expecting someone to invest in it. This thought was a little overwhelming. Readers of my newsletter know by the way what I’m doing when I get overwhelmed. But guys, I wasn’t that overwhelmed, so I didn’t had to do the exercise. At some point I came to the conclusion that the main topics of my blog are people, the human mind and life experiences. Yes, there are some other categories, but this three topics are the heavy-weights as far as I know. You see, for a moment I didn’t even know anymore what my blog is about. It was pretty confusing. I could say this blog is for and about people. About life itself. About, hmmm, help me out! It’s now 3.38 am and you know what I think right now? If you ask any of my returning, regular visitors you will get an other answer every time. I already know that nearly everyone would say that my blog isn’t about blogging or making huge amounts of money whilst making dinner. This blog isn’t even a business idea, though I feel some ideas coming up. Readers are the most important value of any blog or website. And as the readers are interested in my blog, I am interested in the opinion of my readers. Thus, dear reader, please help me out at this point. What is my blog about in your opinion? P.S. : I nearly forgot to mention that I wrote a new About Page. ← A Curfew Because There Are Criminals Out There?